Contra Costa County Public Works is trying something new to discourage sideshow activity by adding bumps to the roadway surface. Jodi Hernandez reports. 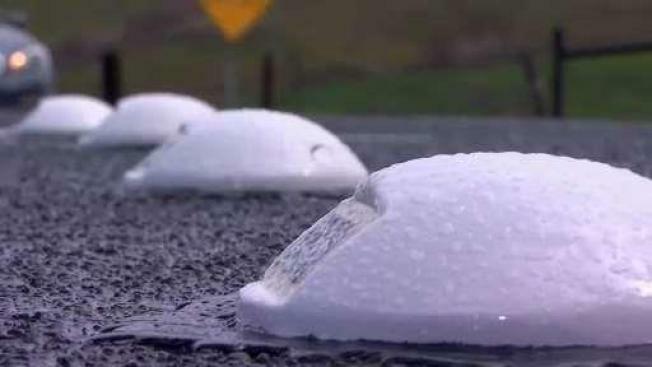 Contra Costa County Public Works is trying something new to discourage sideshow activity by adding bumps to the roadway surface. The agency has installed 100 of the traffic calming implements at the intersection of Alhambra Valley Road and Bear Creek Road in the unincorporated area northwest of Briones Regional Park. The location is fairly rural and adjacent to agricultural land, but extensive skid marks have been documented in the intersection. Referred to as "raised concrete markers," the dome-shaped structures are nearly 2 inches tall. County officials hope they'll make the intersection in question a less comfortable destination for sideshow drivers to spin out or do "donuts," but they'll have to rely on feedback from residents and law enforcement to determine if the new tactic is successful. Road crews have also installed additional signage to warn drivers of the new markers before they arrive at the intersection.